Hundreds of veterans, their families and friends and members of the RIT community gather to pay tribute to individuals who serve or have served honorably in uniform at the annual Veterans Day Breakfast. Hundreds of veterans, their families and friends attended the eight Annual RIT Veterans Day Breakfast today in Rochester Institute of Technology’s Gordon Field House and Activities Center. Several groups of interest to veterans—including the Veterans Outreach Center and the RIT Veterans Club—provided information about the services they offer, and numerous military vehicles were on display. Eric Wheeler, assistant director of Career and Veteran Services at Monroe Community College and a member of the RIT Veterans Breakfast committee for years, served as emcee. Al Herdklotz served in the Navy from 1962 to 1971 and then the Air Force from 1972 to 1985. He attended the breakfast wearing a vest filled with military patches. “I’m commander of the Pittsford American Legion and it’s important we remember our veterans and give everything to support our brothers and sisters in arms,” he said. Roberta Buckle of Penfield, who works at the Monroe County Veteran Service Agency, wore a red, white and blue shirt to the breakfast, which she has attended for the past four years. Mark Vinci, of Rochester, served in the Army from 1989 to 1997. “I think it’s something we need to remember, not just watch it on TV, and it’s also a great form of camaraderie,” Vinci said. His son, Enzo Vinci, 11, joined him at the breakfast, and said he plans to attend West Point. This year’s theme was RIT veterans during World War II. 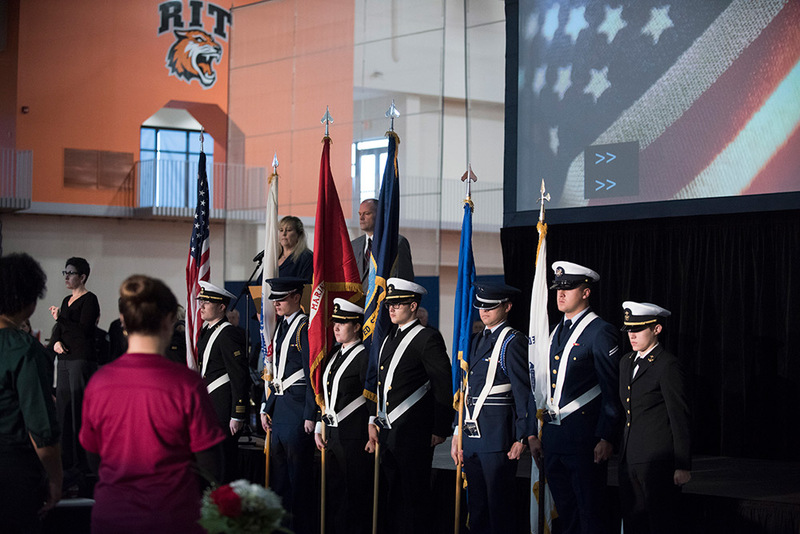 Barry Culhane, executive assistant to President David Munson and chair of the event committee, said RIT has a long history of accommodating the educational needs of returning veterans, dating back to the end of World War II. Thanks to the GI Bill, 90 percent of new college students in 1946 were veterans of WW II. He said it also is a good opportunity for families of servicemen and women to get a better understanding of military culture. More than 150 ROTC Army or Air Force cadets attend RIT, and U.S. News & World Report reported RIT among the best colleges for veterans in the country. The Army ROTC detachment in Rochester was initiated in 1967 when the Army advised RIT that it was interested in establishing an ROTC program in the area. The detachment today has students from five other area colleges, and the ROTC provides scholarships of varying lengths to their college cadets. The Air Force ROTC Detachment 538 became a full-fledged detachment in 1986, when the Arnold Air Society Squadron was formed at RIT. It was renamed Detachment 538 in 1989. Cadets from five other area colleges are also members, and cadets graduate and go on to serve as pilots, combat systems officers, cyberspace officers, civil engineers, intelligence officer, maintenance officers, missile officers or other careers in the Air Force.